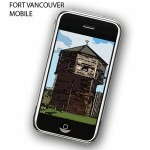 “Fort Vancouver smartphone app brings history to life” by Tom Vogt, Columbian.com. January 15, 2012. Front page article featuring the development of the unit about William Kaulehelehe. “WSUV program links technology with community” by Gordon Oliver. Columbian.com. December 11, 2011. Project receives mention as part of ongoing activities of CMDC program. Also found in print version of the newspaper. “Digging into history, archaeology at the fort.” by Tom Vogt. Columbian.com. June 20, 2011. Also found in print version of the newspaper. “Phone app guides visitors through Fort Vancouver.” Fox 12 News Oregon. July 18, 2011. Released today! @Fort Vancouver. Fort Vancouver Trust. May 19, 2011. “WSU Vancouver Pair Awarded $50,000 NEH Grant for Fort Vancouver Project.” Clark County Blog. April 19, 2011. “Faculty grant to enhance national park interpretation.” WSU News. January 8, 2010. “Bits and Pieces: Grant to support interactive content for Fort Vancouver.” Colombian.com. January 4, 2010.